I need not only to import the data from a cell, but also the cell background color. I've found ways to import color, but it's usually on a 1:1 basis (for example A1 color from the source gets copied to A1 on the destination). My particular need won’t be 1:1. The destination sheet is a pared down version of the master sheet. I will be setting the IMPORTRANGE function on individual cells. For example, I set the IMPORTRANGE on B154 to import AG5 on the source. I need the data to be imported and also the cell background color. My "source" spreadsheet is fairly complex and manages the flow of my entire business. We are a small hotel and the source spreadsheet contains data about reservations and financials. 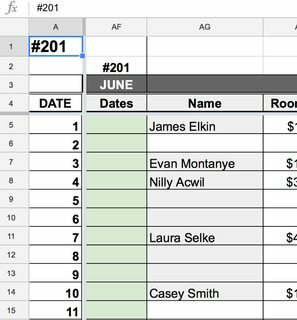 I created a second spreadsheet (“destination”) which is very simple and contains only one sheet and five columns (one is the date and the remaining four represent each of our guest rooms) and 366 rows — representing each day of the year (leap year). The basic purpose of the destination sheet is so the service staff can check it on an ongoing basis and know the reservation schedule and know when a room needs to be reset. IMPORTRANGE is the perfect solution for this and I’ve already set it up. BUT in addition to the data being imported, I also need the cell color. As you will see in the images below, the color represents the duration of the guest stay. This could no be get done directly by using built-in functions only. IMHO the straightforward solution involves the use of Google Apps Script, more specifically the copyTo method with options. 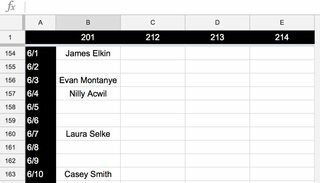 How can I get Google Sheets to auto-update a reference to another sheet? Query formula limitations Google Sheets?